On Scene: Pass It On: The book that keeps on giving. Pass It On: The book that keeps on giving. We are so excited to be selling a brand new book, written by our friend, Chief Billy Goldfeder in collaboration with some of his friends and fellow firefighters, Pass It On. We reached out to Chief Goldfeder to see what he would like to share with you, in regards to his new book release because we felt his words would be something you'd want to hear. He's had a friendship with TheFireStore for a long time, and we're thrilled to be carrying his new book and want to get it in your hands! "I was so thrilled when I found out that TheFireStore was going to help out our cause by selling PASS IT ON! While I PROMISE every firefighter will gain and learn from this book, their purchase, through THE FIRE STORE, will help two very important charities: The Chief ray Downey Scholarship and The National Fallen Firefighters Foundation-an organization that Chief Jim Witmer, The Fire Store's CEO, has been passionately supporting for decades. My excitement carries a bit further and a little more personal as Jim and I have been good friends for many, many years. Watching Jim build his business in serving the world's firefighters has been nothing less than a thrill! And knowing Jim, when he insisted on becoming a vendor for this book, it didn't surprise me-as Jim has spent a lifetime of serving firefighters, his family, friends and strangers through his life long giving. Its a personal pleasure to have TheFireStore offer PASS IT ON to their customers. Several years ago I was asked to write a book and really couldn't decide what to write about-that hasn't already been written...so after a lot of thought, I figured why not get 99 friends to write it with me (or for me!?) ! That's what we did with PASS IT ON-What We Know, What We Want You To Know! I reached out to well over 100 folks who have been intimately involved with the fire service-as firefighters, officers, chiefs, heroes, instructors, parents and family members of the fallen-and much more. This book will give the reader a chance to hear from those who have been there-done that-sometimes in a joyous manner and sometimes becoming the absolute worst day of their lives. Words from people who the reader would normally not have a chance to learn from....and words from people who, in some cases, never shared their words before now. Not a firefighter? 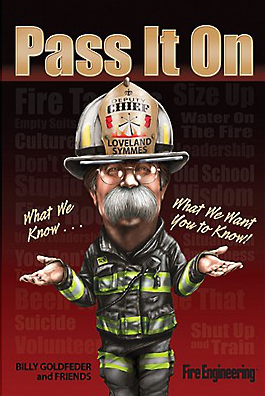 This book is a book for anyone who even remotely has an interest in the fire service. Family members and friends of Firefighters? Absolutely. This allows those who have "never crawled down a hallway" to take an inside look at what being a firefighter is about-through the words of those who have survived. When you look at the list of contributors, it is absolutely impossible to finish this book without it positively altering who you are-as a firefighter, officer, chief or a fire service family member or friend." Consider giving Pass It On as a Father's Day Gift this year, even! Check out more details and snag yourself a copy, here.